Welcome to my house tour! As you probably know, my husband is a dental student so we packed up our little car and relocated from Mesa, Arizona to the great state of New York! He attends to University at Buffalo School of Dentistry so we are living in Cheektowaga, New York. Cheektowaga is a suburb of Buffalo. We are renting our home from a fabulous family that just finished their dental school journey. We moved in July 2011 with exactly what fit in my car. THAT’S IT! Not a “stick of furniture” as my grandmother said. We basically had our clothes, toiletries and a few personal things. PS. we have a Nissan Rogue (a small crossover SUV) that my hubby drove across the country so most of my clothes didn’t even make the trip! We are on a major tight budget due to my husband being in school full-time and I only work only 2 days a week. My goal was to prove that decorating can be inexpensive and anyone can do it! We did not pay over $40 for any of our furniture or accessories (with exception to our sofa and our mattress) and we did all of the furniture, makeovers and decorating ourselves. I was really nervous about moving 2000+ miles away from “home” to a place I had never been and to a place and I didn’t even know one person. We rented our house without seeing the house or neighborhood in person. We got very lucky that everything went smoothly renting a home across the country. When you walk through the door, you step right into our living room/family room! I have a tutorial for just about EVERYTHING in this room so check out the Living Room post here. We spend the majority of our time in this room. It is the perfect space to play and relax with the kiddos! Next you walk through the striped hallway! 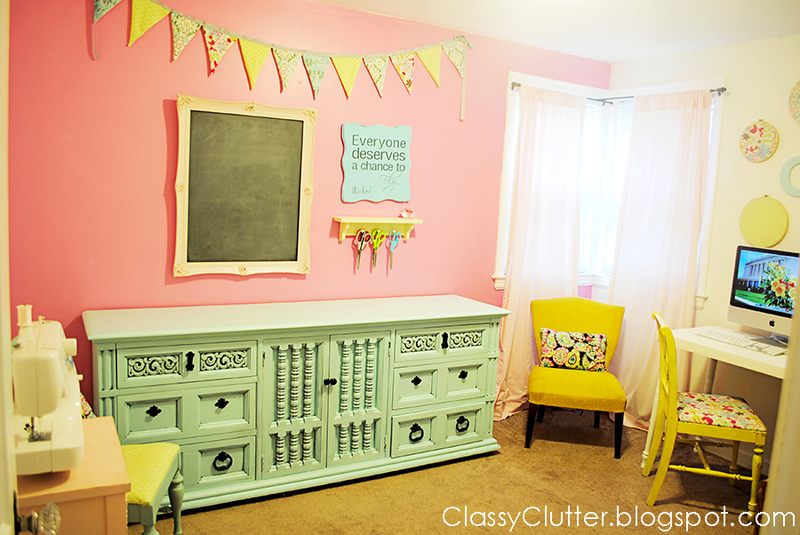 See the full Craft Room Reveal here for all tutorials ‘n such! Then, right next to my craft room is our bathroom. 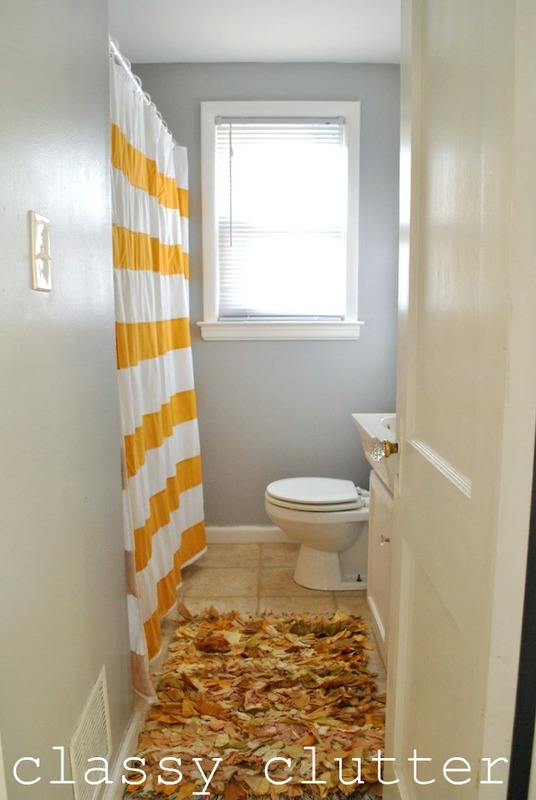 See the full Yellow Bathroom Reveal here. Master bedroom reveal post here. Down the other direction in the hallway is our kitchen and dining space. We obviously spend lots of time in here too! I have a couple more little projects for this room but it is one of my favorite rooms for sure! I updated the kitchen with paint and accessories to make it match my style and vision. I really love how it all came together. I couldn’t be happier! 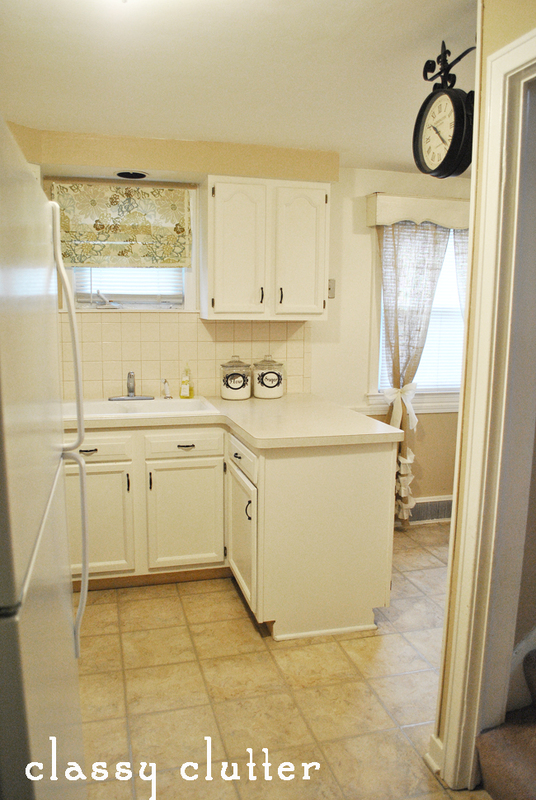 The full kitchen reveal post can be found here. Then, of course, our little dining room space. It took me some trial and error to see where I wanted this space to go but once the kitchen cabinets were painted, I found my inspiration and got her done! See the full post here. Finally, I’ll take you upstairs to spy on the kiddos! hehe! Juuuust kidding! Kind of. Let’s check out their airplane inspired room. My boys love their airplane room and I do too! Its such a great place to play and go crazy! But it cleans up nicely! I love that. 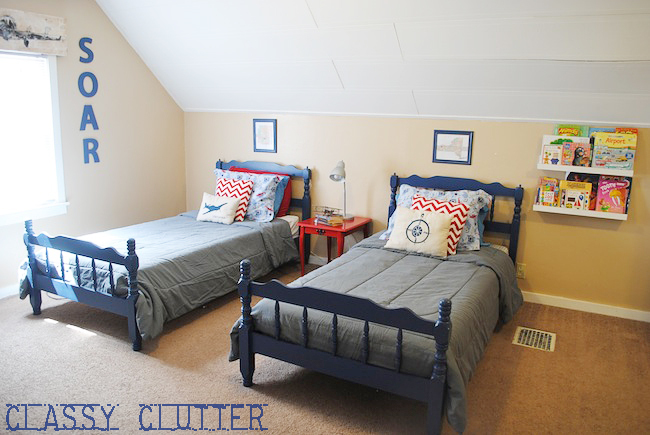 You can find my little boys’ bedroom / playroom makeover here. But of course, if you don’t find the boys playing in their room, you can probably find them out in the back yard! Our backyard is my current project and I’m LOVING how it’s coming along. I’ll show you soon I promise! You can’t beat gorgeous green grass and a place to play and relax! Wowza! This post has me motivated to clean my house!!! haha! Just a little FYI to keep it real, if you stop by for a visit, maybe 1-2 rooms will be this clean. Otherwise you’ll find toys, laundry and chaos running about… and guess what? That’s how we like it! I love that my home cleans up nicely but is a place that we can LIVE IN! Kids are encouraged to run around and play, jump on their beds and have fun! I have about 2398247392 million ideas and projects to go but I finally feel like we didn’t “just move in”. And lemme tell ya, that’s a wonderful feeling! I am so grateful to have a home that I love and fellow bloggers to inspire me to make this little rental house feel like home for the next 3 years at least. Well friends, what do you think? What room is your favorite!?? Oh, my. How could I pick just one room as a favorite? Everything looks just gorgeous. I am so impressed with your decorating style and the skills you’ve shown. love it!!!!!! everything looks amazing! I am impressed! LOVE IT ALL! sooo cute! 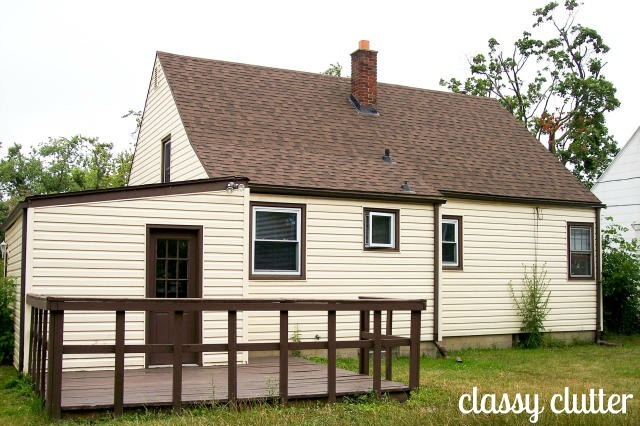 Your house is seriously adorable! I love all of it! U R Awesome!!! We did the same thing coming from HI 4 yrs ago, when we moved into our house. It’s sort of freeing starting from a fresh slate. You have done an INCREDIBLE job! Your house looks awesome. No one would ever know you didn’t spend a lot of money! I love all of the grays, and stripes, and yellows! And all the light colors!! So nice!! I seriously LOVE your house…every single inch of it! You have done an amazing job! 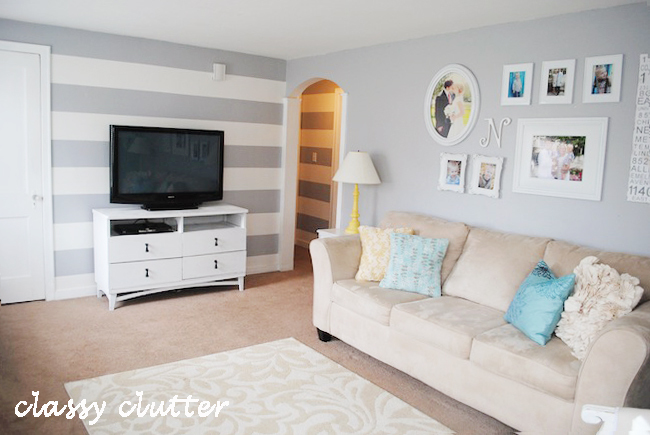 I love your living room – the grey and white color scheme is a new favorite of mine. And your boy’s room is so adorable! Can’t wait to have a house of our own to decorate! I love what you have done with your house! It looks great, and I love that you created such beauty on a budget! Plus you showed your home doesn’t have to be 4,000 sq feet to be well decorated! I really do LOVE what you did with your place and the crazy adventure you are all on. it is SO light and bright! you have done an amazing job! i love it all- i think the living room is my fave! but i love it all! What a charming home – so bright and happy! I love it all, but the craft room is just so cool! I like all of your rooms. I like how you carried the stripes throughout. But, the craft room is calling my name. Who knew you could make a rental look so fab?! LOVE all of the gray in your house! 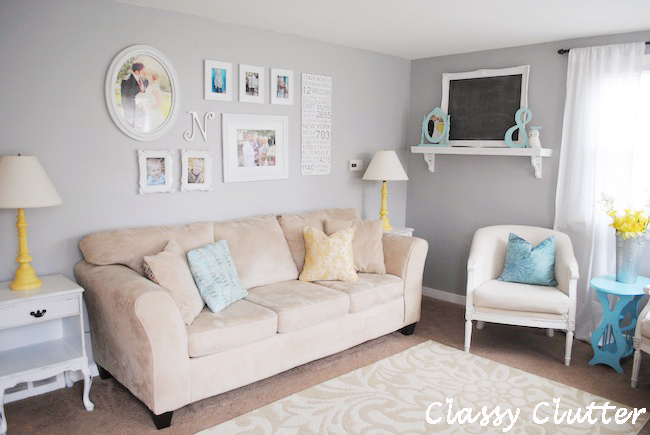 I am wanting to paint my son’s room gray and that is the perfect shade! what brand and color was it?? Congrats on your I love organizing feature! You are doing such a great job turning your rental into a home. Most of the renters I know just save there great ideas for the day when they have their own home, but not you! Your place is beautiful! Your home is BEAUTIFUL!!!! I live just south of you in the Jamestown area….found you through I Heart Organizing!!! I moved into my house about a year ago and have done NOTHING close to all you’ve done!! You have a new follower now and am hoping to pick up some tips and inspiration from all you’ve accomplished!!! Loved that you made your rental a home. We have owned twice in the past but with moving around because of the military (& this economy) buying again just wasn’t the smart choice so we are renting as well. It isn’t the ideal situation but my home is were my husband, daughter, and dogs are so we make it work. 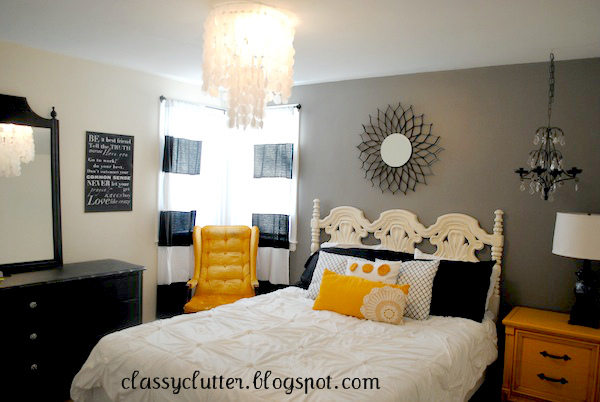 I love your mix matched pieces of furniture and how you tie them altogether with paint! Great ideas, I`m inspired! Lovely home! You’re so sweet! We couldn’t have found better tenants! We love all that you have done! Your house looks great, and I love how you’ve made a rental a home. Came over from I heart organizing. Oh your house is looking so great! It is so homey and bright. I think it would be easy to live there. Thanks for sharing! Just came across your blog via I Heart Organizing…what a precious house. I’m in love with so many things!! 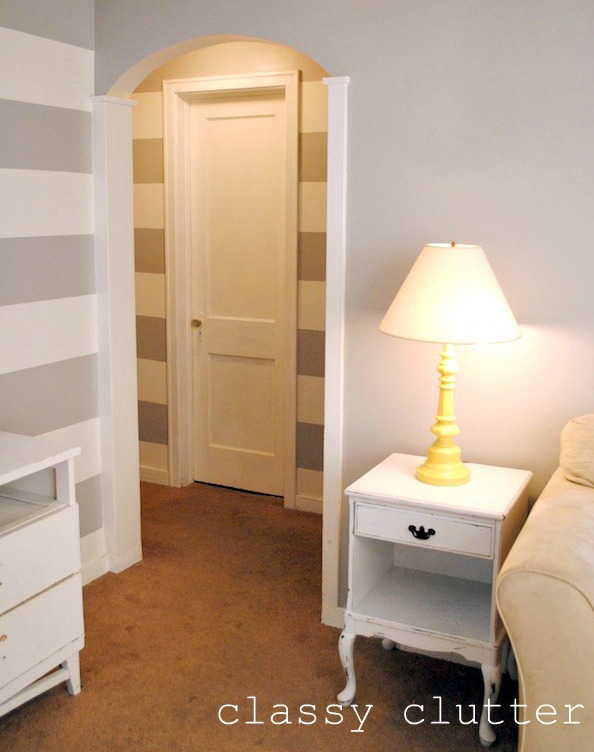 I think the gray and white striped walls might be my favorite – really pretty. I’m a new follower :). I love your rental house that you turned into a home for your family. No one would ever know you were renting and that you decorated on a budget. Every room looks so inviting . . . I especially love your living room and bedrooms! You did an awesome job. Can’t wait to see what you do with the deck and backyard! This reminds me of when my husband was in medical school & residency–except we couldn’t paint the walls! You’ve done a beautiful job! The boy’s room is particularly cheerful. HOLY AMAZING CUTE! I want to move in! Every single room is AMAZING. I need you to come decorate my house because your taste and style is gorgeous!!!! Not sure how I got here, but thanks for sharing your house. I’m so over seeing ginormous houses in the blogsosphere that I can’t even relate to. This house is charming, both in size and decor. Beautifully done. 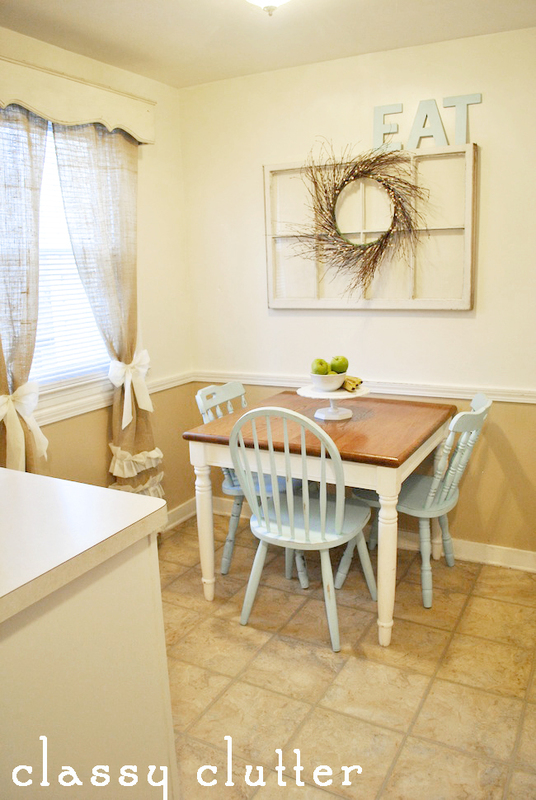 What a beautiful redo and such a warm place that you’ve created for your family. YAY! for you and your creativity. 1. Mallory, your house is AWESOME! 2. I did not realize you were from Mesa. I live in Tucson. Small world. Seriously **Love** your home! You have done amazing things… And not a piece of furniture forever 40.00 accept for the 2 you mentioned? That is AMAZING! Everything looks SO expensive and classy! Love your blog! Hi there Mallory! I used to be an avid reader of your blog but got really overwhelmed at college and fell behind with all of my blogging. I’m back and am so excited to be reading your blog again! I absolutely LOVE your living room. Don’t get me wrong, all of the rooms look STUNNING, but you asked which was our favorite! :] I just love the relaxing color combinations and that antique-y feel! It is amazing! I’d love it if you swung by my blog sometime and checked it out (revamping). Just wanted to let you know I am a brand new reader to your blog and this is the very first post of yours I’ve read and I’m hooked! I love your house and what you did to it to make it your own. Looking forward to reading more! Seriously, I’m obsessed with your entire house! I think I have at least 3, maybe more, of your rooms already pinned on Pinterest for inspiration and am just now realizing they are all in one, awesomely put together, house. LOVE IT! Um, you are a rental house owners dream come true! Imagine how easy it would be to sell that house when your family is done living there. I dream of finding renters like you. And i LOVE all the pops of yellow and the gray stripes. INSPIRED !!!! Love your story. I love your house and what you have done with it. We are currently renting a house and I am truly inspired by what you have done. You have made it so homey, cheery and kept it neutral enough to be comfortable. (if that makes sense) Great ideas that I am looking forward to try out. A very glamorous look. Simple and neat looking areas. oh my goodness! 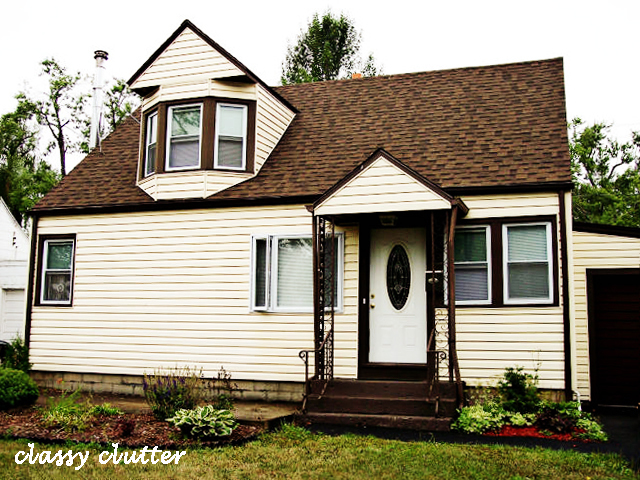 I just stumbled upon your blog tonight and was reading back slowly till I got to this post and I see you in in Cheektowaga – i’m on the border of cheektowaga and williamsville and i can’t believe such a beautiful house is so close to me! i have a bunch of ideas that you have inspired now and i thought i should thank you! so thanks! take care.